The Centre for Development Impact (CDI) contributes to learning and innovation in the field of impact evaluation, through the use of appropriate, mixed method, and robust evaluation designs. It is a joint initiative between IDS, Itad and the University of East Anglia (UEA). Debates around impact evaluation have received renewed interest in recent years. Alongside a growing pressure on politicians and policymakers to demonstrate results and value for money, conventional evaluation approaches are being critiqued for lacking in rigour, and/or being too narrowly focused and unable to capture complexity. CDI’s work will help to broaden the range of evaluation designs and methods, providing funders and evaluators alike with valuable insights and tools to measure and understand impact. Developing and delivering training and learning programmes. 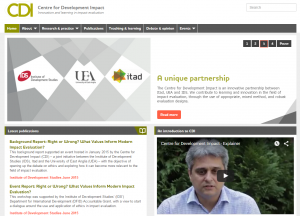 CDI is a joint initiative between IDS, Itad and the University of East Anglia.